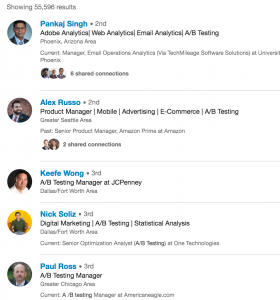 Here are 7 specific steps to make your LinkedIn profile ready for job hunt. You are most likely doing it wrong. Company representative: Uh huh…great, so, good luck! This is not only true for offline events but imagine a recruiter viewing your profile on LinkedIn and getting no clue about what you want or why you are good at it. Check out this infographic (using data from expandedramblings and omnicoreagency) that shows the insane growth and influence of LinkedIn platform. 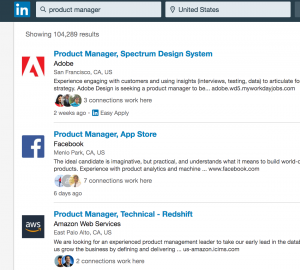 With 500M users, 11M+ active job listings and 20K companies in US alone using it for recruiting, LinkedIn cannot be ignored when you are crafting your internship and job hunt strategy. And yet…80% of LinkedIn profiles I come across are not fully utilizing the power of the platform. I find it amazing that people choose to ignore such a public part of their professional life. Unfortunately, most people do not realize the long term impact of LinkedIn presence. Which is why, I am going to talk about some LinkedIn myths first and then dive into exact steps to get your profile exactly right. Of course, we cannot change our background but what we can do is write it intelligently and make our profiles more searchable and memorable! Well, just like you need a to create a good resume with what you have, same with LinkedIn. It is possible to showcase your profile more impressively by using the basic techniques we discuss here. Everyone starts from somewhere. The profiles that you find so impressive today started with very basic stuff. LinkedIn is so much more than your resume. Plus, while the resume is tailored for a specific job position, your LinkedIn profile has to look good for a broader category of jobs and companies. Are you using correct keywords? Is your headline wisely crafted? Does your professional summary and experience section tell the recruiter what they are looking for? 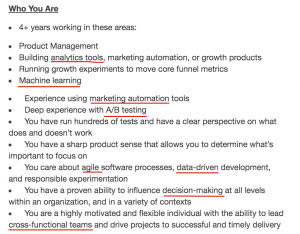 Unless you address these, LinkedIn will not work for you. As simple as that. And it is a long-term strategy but if you do it consistently and always keep up to date, you will see results! More than 94% recruiters use LinkedIn actively. The fact is that every interviewer checks the profile of the candidate before interviewing them. It is the biggest candidate profile database and you need to understand what recruiters are looking for in suitable candidates. Intelligent activity – what posts you like, share, comment etc. 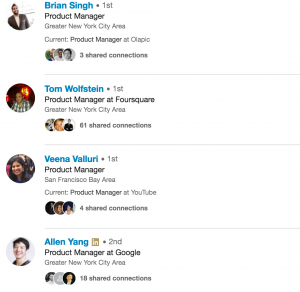 LinkedIn is a part of broader job hunt strategy. To create an effective profile that aids in your hunt, you first need to prioritize 2-3 roles that you are targeting to recruit for. More than 3 can become hard to manage. I recommend targeting related roles which require overlapping skills and fit with your background (experience or/and program of study). For e.g. 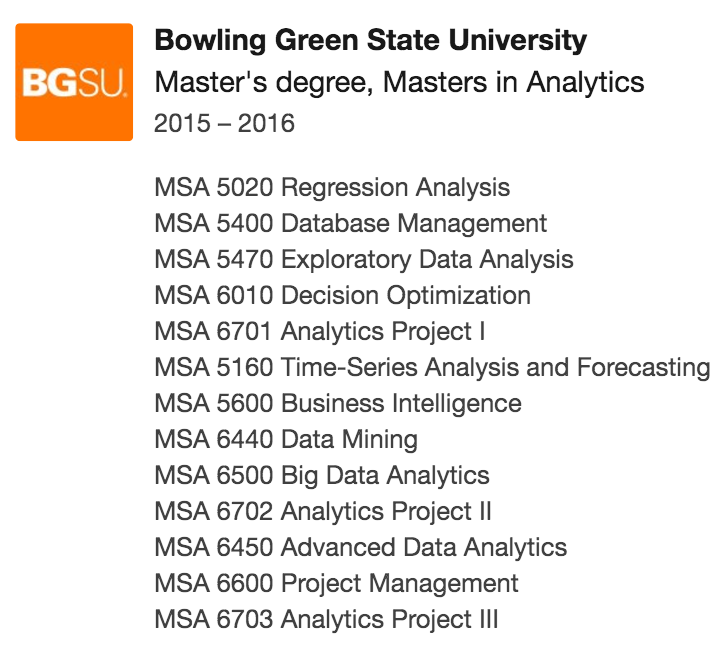 a Computer Science grad might target Software Engineering, Data Scientist, and Data Engineer. 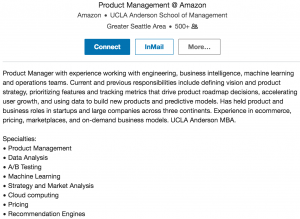 Another CS grad might target IT Analyst, Business Analyst and Program Manager roles. 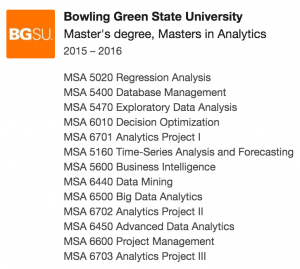 An MIS grad might be targeting IT Consulting, Software Engineering and Product Manager roles. Targeting divergent roles which require very different skillsets is hard to manage because a visitor/recruiter may be confused about your ambitions. We will discuss below another very important reason why you must figure out what roles you are looking for. 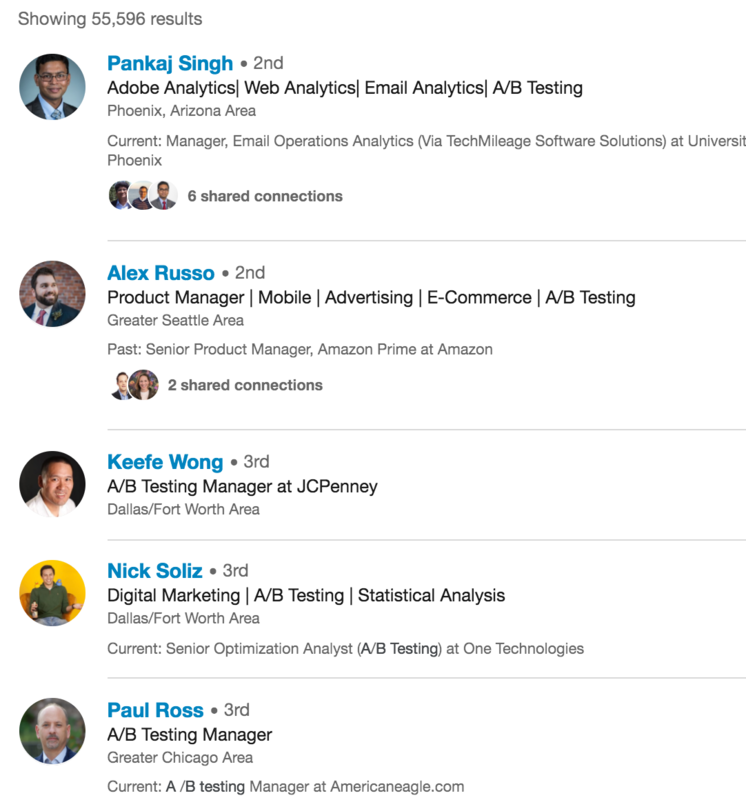 Job hunt has become very keyword driven process because given the exploding amount of data online, employers need some system and process to filter relevant candidates. The downside is that the search results can be only as good as the process. As a candidate, you need to make it easier for the employer to find you and this is where it is a must that you understand how keywords work. Employers use application tracking software to review resumes and online job applications. Such software looks for keywords within your resume or application to filter out applicants who may not be qualified. So, even if you have a good profile for the role but you are missing out on standard keywords related to that job, you might miss out on being shortlisted. That said, we are not going to go paranoid on keywords. But we will make sure, we use whatever keywords are relevant to us. Please understand that keywords alone will NOT get you recruited but it helps to be shortlisted. 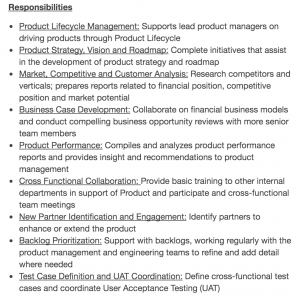 For the sake of this article, I will focus on product management role. We first need to understand the mindset of our employer and speak the language that they are speaking. Best way to do this is to read 20-30 job descriptions for our target role and find commonalities. 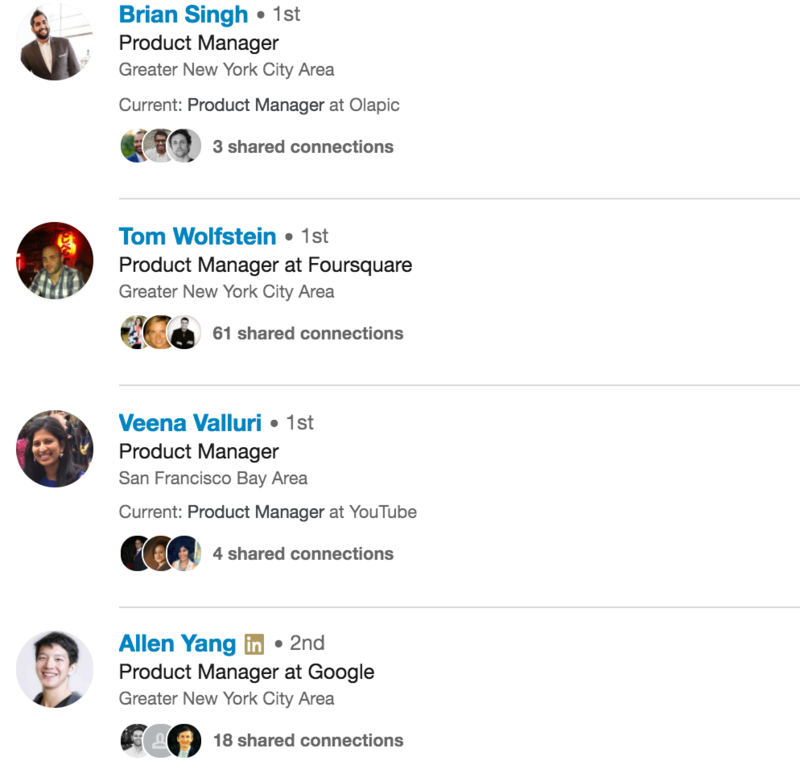 You can search for jobs on LinkedIn by specific location. Put in your criteria (I would recommend not narrowing too much at this point – remember, we are just researching keywords right now). 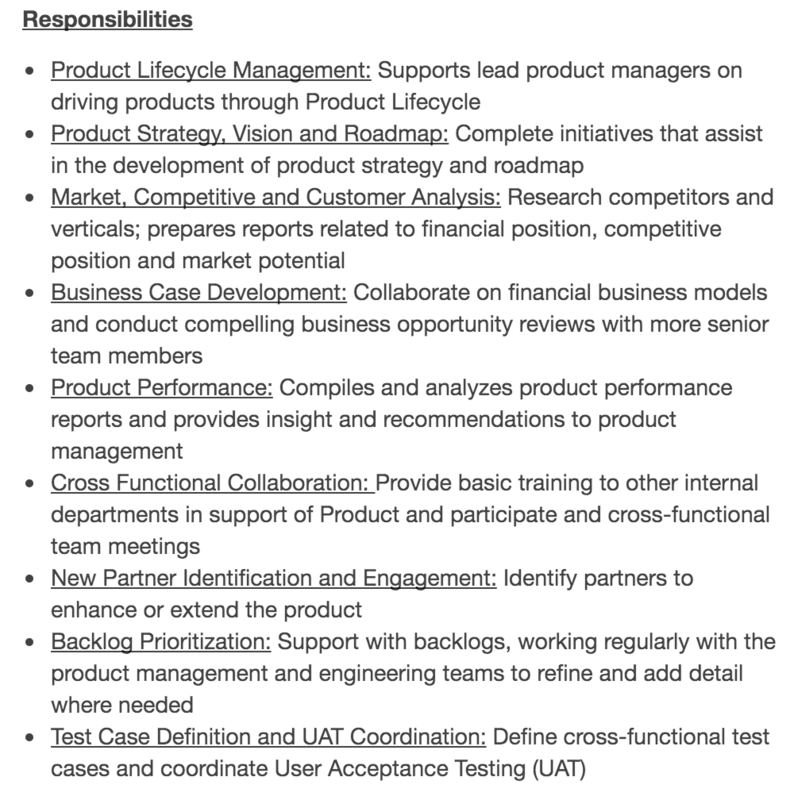 This is what I found for a basic search of product manager positions in Bay Area. 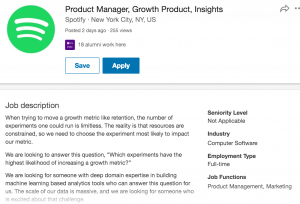 If you are looking for internships, look into product manager internships. You will find 5-7 openings which are more specific in their descriptions. These are the ones we want. 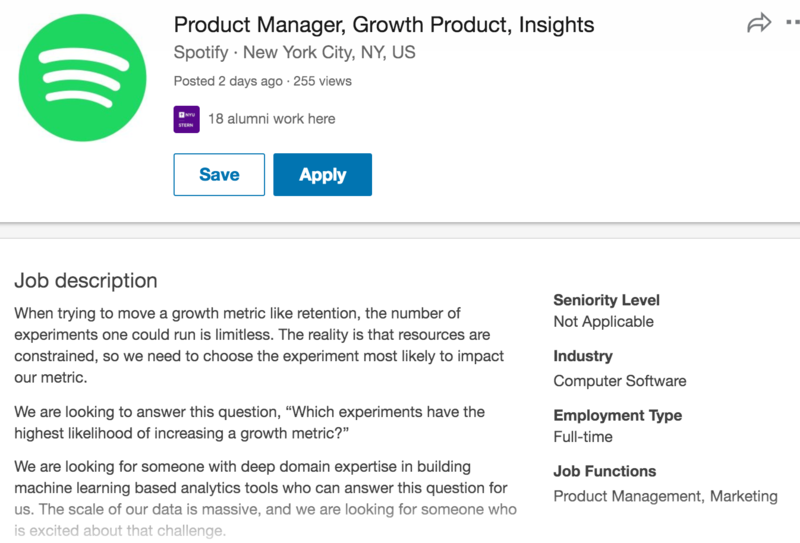 For example, Spotify had a Product Manager opening and I am picking it because it mentions specific skillsets they are looking for. This section usually gives you the best keywords for this role. 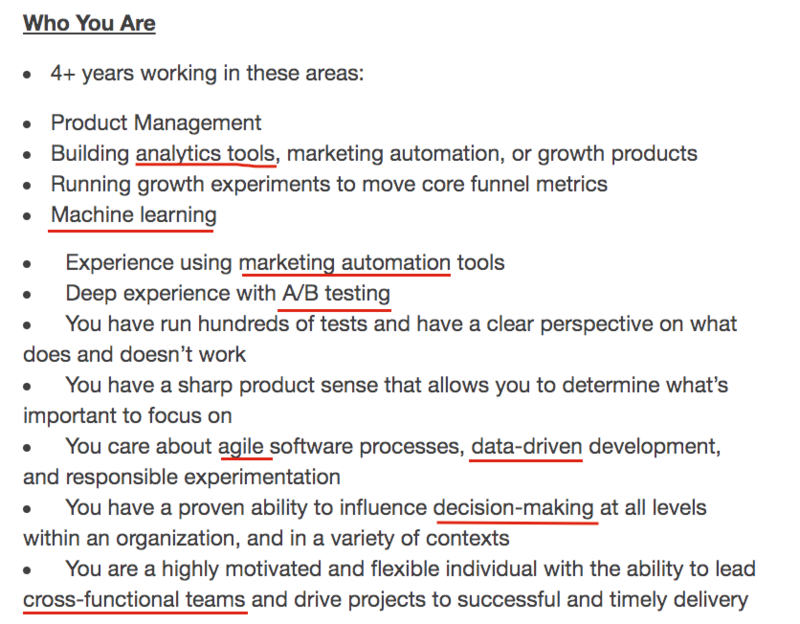 I can spot the ones underlined in red. Scanning enough of these will give you a list of 10-15 keywords to begin with. People who have been in industry for sometime are used to interviewing and know what it takes to be recruited. Just like practice makes you perfect at something, researching and doing your homework on good profiles and experts in your fields can help you avoid the common pitfalls. 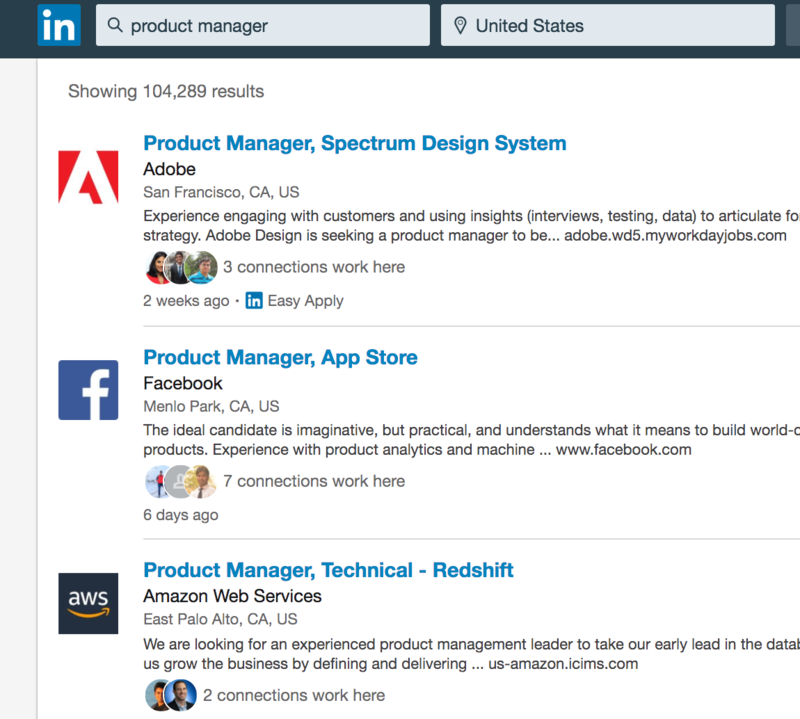 Begin with a LinkedIn search for your desired job title in the people section. 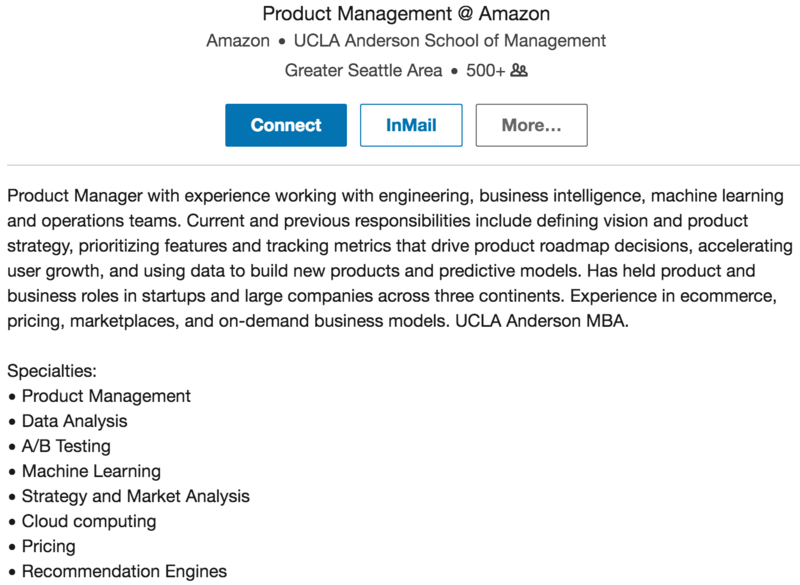 That is the beauty of LinkedIn, it shows me 500K+ search results for ‘Product Manager’ in United States! You know you are looking at good keywords when you can find it both in the job descriptions and the profile summaries of good professionals. For e.g. we have seen ‘A/B testing’, ‘Machine Learning’, ‘Analysis’ in both of our searches which validates their utility! By the end of this step, you should have 5-10 keywords that you can use. Voila! The worst thing you can do is just add titles in your positions and not describe what you did. For one, titles cannot clearly communicate your accomplishments in that role. A simple approach is to copy paste the bullets from your resume in this section. But you can be a bit smarter! Ideally, we want to have a 2-3 lines summary paragraph that highlights the big things you have done in this role followed [optionally] by 2 bullet points mentioning the details of your two most important projects/deliverables. I would not keep more than 2 short sentences under each bullet. The summary gives a quick refresher of your skills and responsibilities and big picture impact you created. Bullet points provide details that someone really interested in your profile might be looking for! Let’s look at this example. The first paragraph wisely describes what the company does (important for lesser known startups). Second and third paragraphs summarize this person’s contribution. Now, it is time to pick the relevant keywords we shorlisted in previous step and use it in our description here. For e.g. 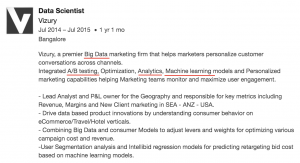 following profile does a good job at integrating the industry relevant keywords (underlined). Next step is to write an effective professional summary for your profile. It is the section that appears at the top of your profile – between your photo and your experience section. Resumes should be created customised for a particular job position but LinkedIn is more generic. Therefore, you should have a broadly relevant summary on LinkedIn and very targeted summary on your resume. LinkedIn website collapses anything more than 200 characters on desktop and 90 characters on mobile devices. So, you want to write important stuff in first 90 characters. One can expand to read it but even then you don’t want to write more than 2 paragraphs. 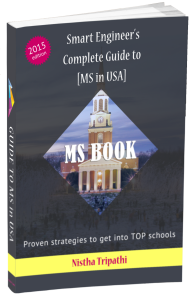 In fact, the preferred format is one summary paragraph and then, a list of your expertise. This is what we noticed in our examples in our ‘research the keywords in profiles of professionals’ step. This is your chance to tell your professional story – not only what you have done (which is evident from the experience section anyway) but why and how. This is where we add a human touch and stand out from our competition. And, you can add if you are looking for internship/job. 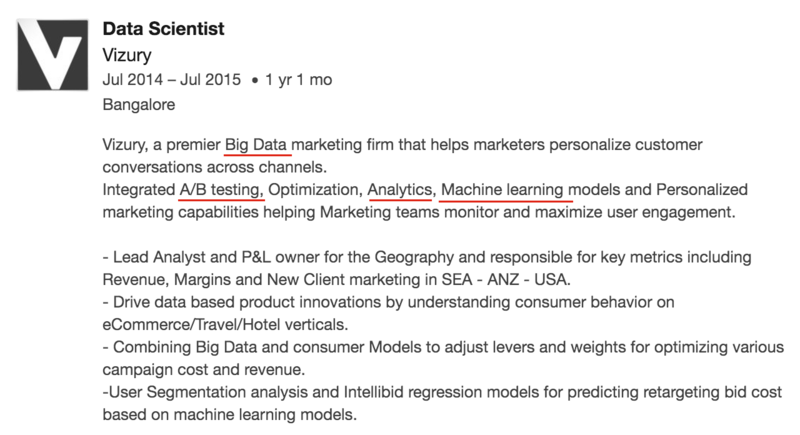 But, if you read a bunch of LinkedIn profiles, you will come across some that make no sense whatever. These are epic fails because – 1. They tell you nothing about the qualification/expertise of this person 2. They tell you nothing about the personality/achievements/dreams of this person. We remember someone because we can put a face to them but descriptions like these make you robotic and totally unremarkable. So, avoid the fake or MBA buzz words like ‘self-starter’, ‘go-getter’, ‘motivated’ blah blah. Come up with your words, your way of saying things, your voice and put it up there. As James Altucher says, a good self-promotion has lot of ‘self’ and less ‘promotion’. Let me see your self. I bet you can see a confident project manager behind this who knows how to deliver! Coming back to a structure for this section, what, I found, works is a short summary in a para followed by list of keywords/skills that are crucial in your field. Notice the human language, a clear big picture and expertise. As the seniority level grows, the profiles become more specialised and you will find a senior professional talking about more and more specific skillsets. As grad student, you can however, keep it relevant to 1-2 fields. Now comes the time for the most visible part of your profile i.e. the headline. It is your business card of the old days. But unlike a business card, it is not a mundane business title qualification that we have to flaunt, we can make it more interesting. Apart from your profile picture, it is your headline that people notice in the search results and that determines how likely they are to click on you. You might have a great profile inside but if you do a sloppy job with your headshot and headline, your chances of being shortlisted go down. This is a good approach when you are working at a well-known company and have a flauntworthy title. If not, you will need to be more creative. And if you are actively recruiting, then, put some sincere efforts here! Expertise – As shown in above search listing, these people have chosen to highlight ‘A/B testing’ in their headlines. If you are an expert in a niche area and actively recruiting for it, you can consider fitting it in your headline. For Grad Students, I recommend showcasing top school names, company names and role for which you are recruiting. I would suggest using innovative approaches to make your LinkedIn profile more ‘searchable’ only if you are actually comfortable with these topics. Remember, you can be asked to elaborate on any word in your resume during an interview. You don’t want to be someone who struggles to justify the things he has mentioned in his resume. Nothing mars your reputation like untruthful claims! Want to get the presentation used by me in the video? Enter your email to download that right away. Applying for graduate schools?, we have step by step advice on Scholar Strategy newsletter. Please sign up now.